The combination Carbon Monoxide/Liquid Propane Alarm is mounted on the lower cabinets. Follow instructions on the safety sign next to the stove and air out the vehicle to silence the alarm. Have a qualified service center find the leak and correct the problem before using the motorhome. Refer to “Liquid Propane Gas System” section in this manual and LP Gas Alarm owner’s manual located in the Motorhome Information Kit for further details. Extinguish open flames, pilot lights and all smoking materials. Do not touch any electrical switches. Shut off the LP gas tank valve. Open doors, windows and roof vents after making sure the roof vent fans are “OFF”. Leave the motorhome and its immediate vicinity until odor is gone. Have a qualified service technician check the system for leaks and make any necessary corrections and repairs. NOTE: Do NOT remove the label from the glass stove top cover. Carbon monoxide is an colorless and odorless gas that is lethal to humans and pets. Do not breathe heating or cooking fumes or engine exhaust to prevent asphyxiation. This SAFE-T-ALERT™ CO/Propane Gas Alarm is designed to be easy to operate. The alarm has two indicator lights that display a specific color for each monitored condition. 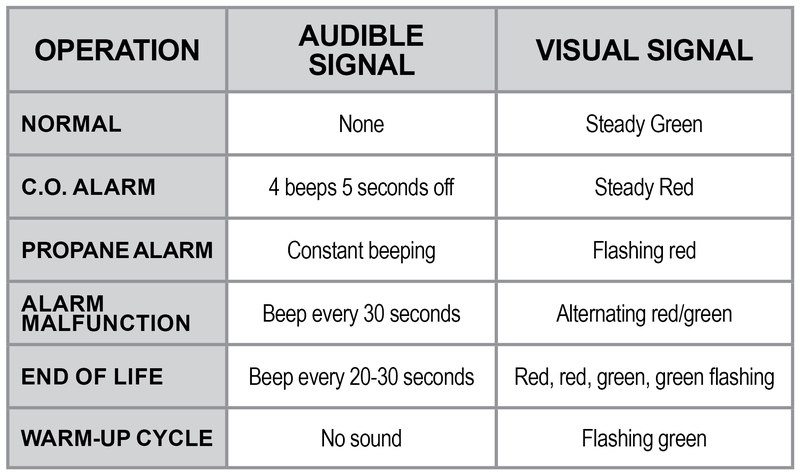 There also is a distinct sound pattern for each alarm condition. The Red CO LED will flash and the alarm will sound 4 “beeps” then will become silent for 5 seconds. These signals indicate that the CO is at a dangerously high level. Immediate action is required. See Procedures To Take During An Alarm. This alarm cycle will continue until the Test/Mute button on the front of the alarm is pressed. Ventilate the RV. The RED light will stay ON until the CO has cleared, or the alarm will reactivate in approximately 6 minutes if the CO is still present. Do not re-enter the RV. This alarm will cease and return to normal operation after the RV is properly ventilated. The Red Gas LED will Flash and the alarm will sound a steady tone whenever a dangerous level of propane gas is detected. Immediate action is required. See Procedures Take During A Gas Alarm. The detector will continue to alarm until the Test/Mute button on the front of the alarm is pressed. Ventilate the RV. The RED Gas LED will continue to flash until the gas has cleared, or the gas alarm will reactivate in approximately 5 minutes if the gas is still present. Do not re-enter the RV. This alarm will cease and return to normal operation after the RV is properly ventilated. If any malfunction is detected, the Gas LED will remain off and the Operational/CO LED will alternate RED/GREEN and the alarm will sound once every 15 seconds. Press the Test/Mute button. If the Test/Mute button does not clear the alarm, check the coach battery voltage. If the battery voltage is not low and the unit will not return to normal operation, immediately remove the alarm and return for service or warranty replacement. See the warranty section in this manual. Use of the motorhome is not recommended without a working CO/LP Gas detector installed. Test this alarm’s operation after each storage period, before each trip and at least once per week during use. Turn off all pilot lights, appliances and appliance igniters before refueling motorhome diesel or propane tanks. Failure to comply could result in death or serious injury. Never use a flame to check for LP gas leaks. Do NOT place or store gasoline, propane or any other flammable liquids onboard the motorhome, because fire or explosion may result. Failure to comply could result in serious injury or death. Propane containers are equipped with safety valves that relieve excess pressure by discharging explosive gas into the atmosphere.